Just having some fun comparing what I thought a few of JPL's Mars mission landing sites would look like vs. what they actually do look like. Here's one from Curiosity. 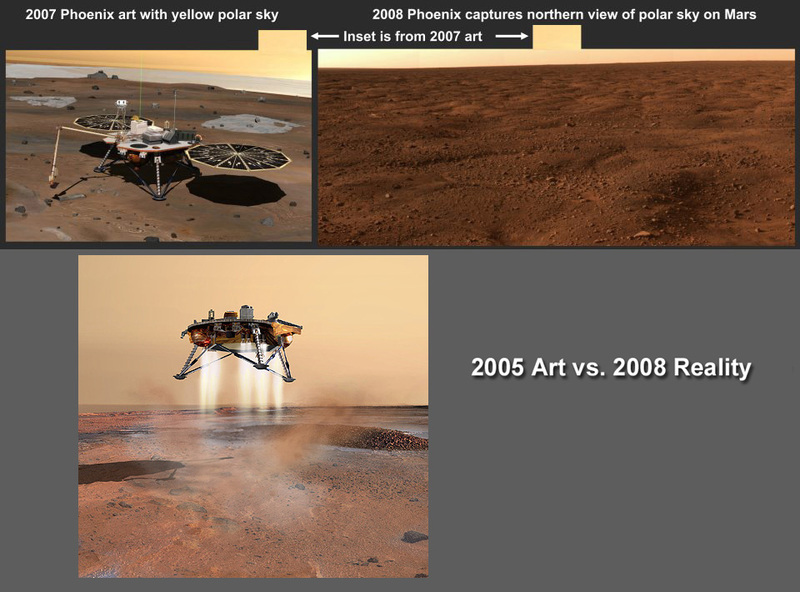 My art is the background, the 2 inset images are from 2012 taken by the rover in Gale Crater. Center inset: early post-landing pic. There was still a dusty transparent lens cap on Curiosity's MAHLI camera which took an image of the north wall of Gale Crater. It looks like my row of mountains and the color of the sky is similar. The left inset is a patch of color from the center of the MAHLI pic. My old art on left has some resemblance to this new self-portrait pic. Of course, the angle of the rover's self-portrait is different. But the big mountain on the right side and general orientation of the rover is pretty good. 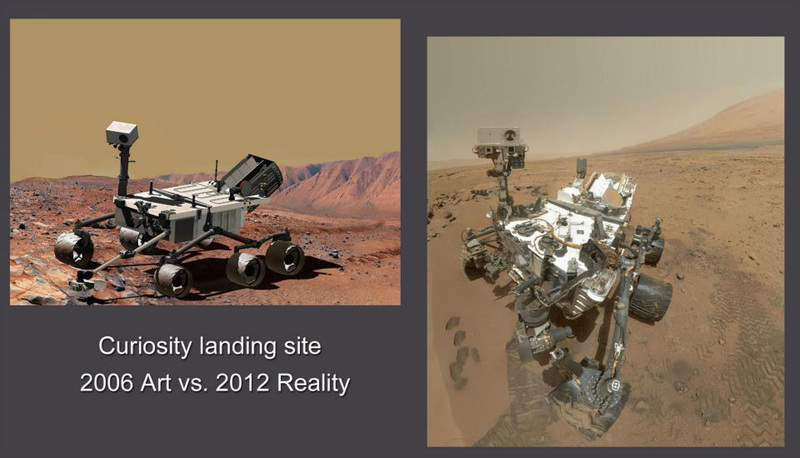 I have to take what I can get since I created the image on the left way back in 2006 long before the landing site was selected. "Phoenix Polar Sky" was one of my best mission art predictions and it was the first one I noticed. You can see a patch of sky from my art on the left is matched up well with the actual sky on the right. The overall appearance of both skies is strikingly similar. The actual pic was taken by JPL's Phoenix Mars Lander looking north. The northern plains of Mars are very flat and perhaps boring. But there is reason to believe there was once an ocean there so who knows what surprises may exist right under that soil. This is a double art prediction. The ancient hot springs scene on the left was created by me for the Chief Scientist of the Mars Exploration Program in 2001. Fast forward to 2013 and the Curiosity Mars Science Laboratory's first sample analysis at "John Klein" outcrop (middle pic). Note similarity to mountain. The outcrop's samples revealed 6 of the essential elements that life needs to exist. The pic on the right is part of a 2001 Mars program mural I created which, again, looks very similar with both the mountain and this time the Mars Science Laboratory arm is in the scene, at an angle that is reasonably similar, considering it was created 11 years before. I created the comet sample return lander scene on the left in 2002. 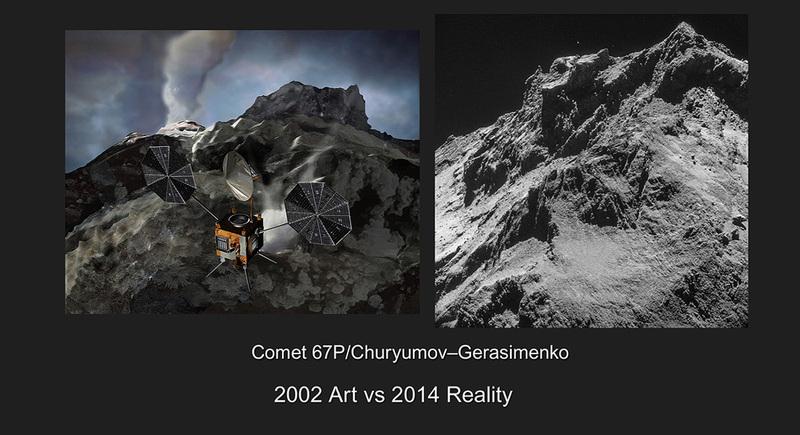 Fast forward to 2014: The pic on the right is Comet 67P/Churyumov-Gerasimennko taken by the European Space Agency's Rosetta comet orbiter. The pic was in this article "Philae finds comet harbors organics". I thought it looked remarkably similar to my 2002 pic so I made this comparison.